All five Indian entries shortlisted in the 2013 edition of Midas Awards, which recognises and rewards financial advertising, have gone on to win. The five are for work on brands from the Aditya Birla Group. JWT India took the lone Grand Midas at the Midas Awards 2013. The agency’s work for Birla Sun Life Insurance titled ‘Death Track’ was honoured with the Grand Midas in the Public Service category. The agency also won a Gold Midas, in the Insurance (Products and Services) competition. The winning entry was ‘Even Gods Can Feel Insecure’ for Birla Sun Life Wealth with Protection Solutions. M&C Saatchi Direct & Digital Communications bagged three Gold Midas awards. All three were in the Direct Mail/Collateral competition. These were for Aditya Birla Money (Hastakshar Mudra), Birla Sun Life Insurance (Karva Chauth) and Birla Sun Life Mutual Fund (Laxmi Papad). "With over 6.25 million commuters daily, Mumbai local trains constitute the world’s most densely populated transit system. 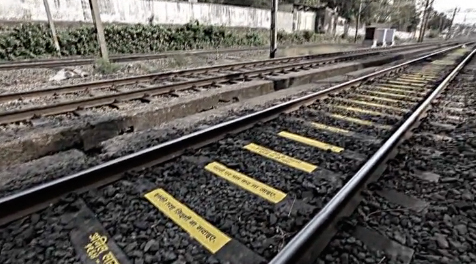 Trespassing on the railway tracks is the biggest cause of railway accidents in Mumbai. It is approximated that over 2000 people die every year. This is despite warning messages on platforms and the millions spent by the Railway Department on constructing footbridges and skywalks to deter pedestrians from walking across the tracks. The general apathy of trespassers was what we this campaign aimed to shake up. We believed a word of caution at the right place at the right time would jolt people into thinking before taking that fatal step. A one-of-of-a-kind ‘memorial site’ was created for railway accident victims, on the Sion-Matunga track, one of the key accident prone zones in the city. The unexpected placement ensured hundreds of passenger views daily. More importantly, it got trespassers to stop in their track. Disclaimer: The names of victims were changed to protect the sentiments of the deceased’s families. Volunteers also permitted use of their name for the cause." Yuvraj Singh, India's dashing cricketer, and Birla Sun Life Insurance's brand ambassador, was diagnosed with cancer in February 2012. Eight months later he made a complete recovery and was selected to play for India again. In one year Yuvraj Singh had actually lived the brand promise - Live with confidence through the ups and downs of life. The integrated campaign tries to do justice to this remarkable bounce back story, which was almost scripted for an insurance company so that others can draw inspiration from it. “We tend to question fate and ask “Why me?” only when things are bad, never when they are good. But instead of doing so, one must be prepared for its ups & downs”. Apart from conventional media, a Twitter contest (asking for bounce back inspirations), Hospital activations (Yuvraj visiting to give hope to others), QR code innovation & a specially created documentary on his life, provided inspiration as well as reinforced the need for insurance. In a world where High Net-worth Individuals are busy making money, finding the time to manage it becomes a challenge. So how do we find the time to speak to them about our Portfolio Management offerings which is ideal for them? Through the knowledge which has enlightened many for centuries, of course! We looked at Mudras – simple hand gestures which work on the principal that our fingertips have the power to enhance our well being. A book commending the benefits of Mudras and the ways to practice them was sent to these HNI customers. Along with traditional Mudras, there was a contemporary one invented by us – the Hastakshar (Signature) Mudra. A pen was included in the 3D mail pack to make it easier for him to provide his signature on the response card. Less than 15 per cent of Indian are insured, the lowest penetration in the world. Of this, less than 3% have a pure insurance term plan. This indicates that insurance policies are mainly bought for tax saving purposes, and not for protection. The challenge was to break this mindset and get people to consider the need for protection of their loved ones. ‘Karva Chauth’- a festival wherein the wife fasts for her husband’s wellbeing and long life, was chosen as the time to send a 3D mail pack to a targeted set of recently married men. A traditional Karva Chauth Thali was sent to the husbands, a few days before the festival. Apart from the typical items, it also contained an unexpected twist in the traditional sieve. A hidden message “As she prays for your long life, ensure that you protect hers” embedded in the sieve was placed to make up for his guilt and make him realize that only by insuring his life with a term life insurance policy would he continue to secure his partner’s future. How do you change the mindset of housewives living in tier-2 towns in India to invest their idle savings? Simple, talk to them in the language that they can relate to the most! The woman of the house usually saves a small amount of money from her household budget, but rarely invests it. The strategy used was to demonstrate how these small amounts had the potential to grow, when saved wisely! Piggy bank shaped papads, branded ‘Laxmi Papad' with an eye catching impression of the Rupee symbol were sent to a set of housewives. These papads when uncooked looked small but when fried in oil grew significantly large! Beautifully and effectively symbolising what Birla Sun Life Mutual Fund's Recurring Savings Plan could do to her savings!